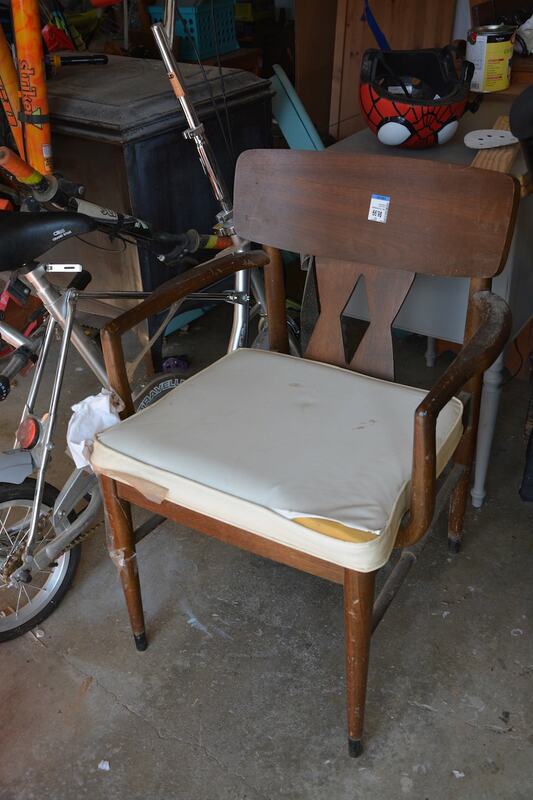 Can I Save This Mid-Century Modern Chair Makeover?? There’s this unspoken rule that you just don’t paint Mid-Century Modern furniture. Well, you can, sort of like how I painted my son’s Mid-Century Modern dresser drawers white and stripped and stained the body. But it still looks like an authentic a MCM style piece (at least, I think so). So you can imagine my frustration at the thought that I might have to paint this entire $6.00 thrifted mid-century modern chair. I really did try to restore it. It just didn’t go as planned! 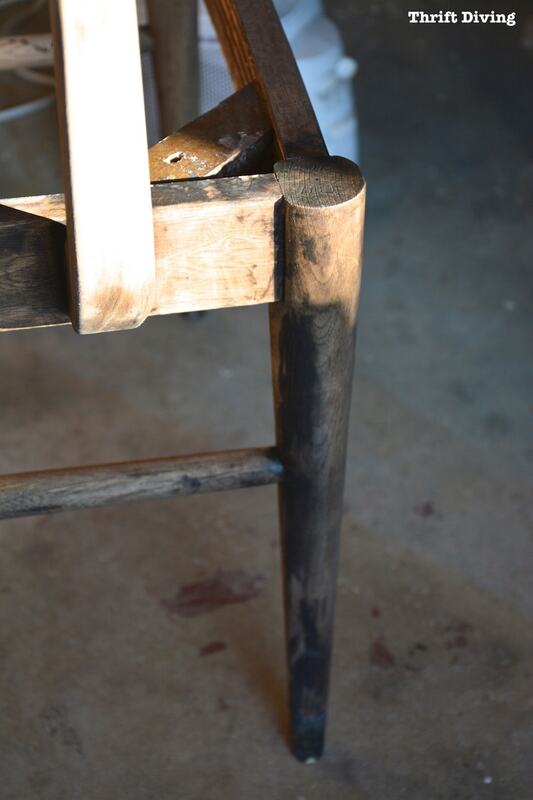 I had shown you how I started this Mid-Century Modern chair makeover last month, but I still had some spots that needed stripping. 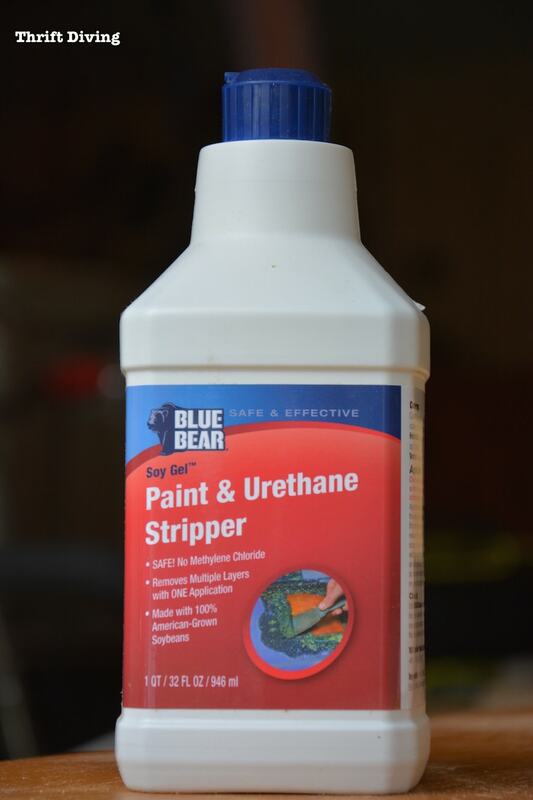 So I applied some Blue Bear Paint & Urethane stripper on it, in hopes of removing more of the old finish. I wanted to try this stripper because it’s soy-based and is supposed to be low odor. I couldn’t believe how non-smelling it was! You can even use it inside if you’re working on a stripping project indoors (especially in the cold months). It kind of reminded me of sugary syrup! Like honey, almost. I slathered it on and waited about 10 minutes or so to start scraping off some of the extra GUNK I had left on last time! When I was done scraping I scrubbed everything down with water to remove the residue. 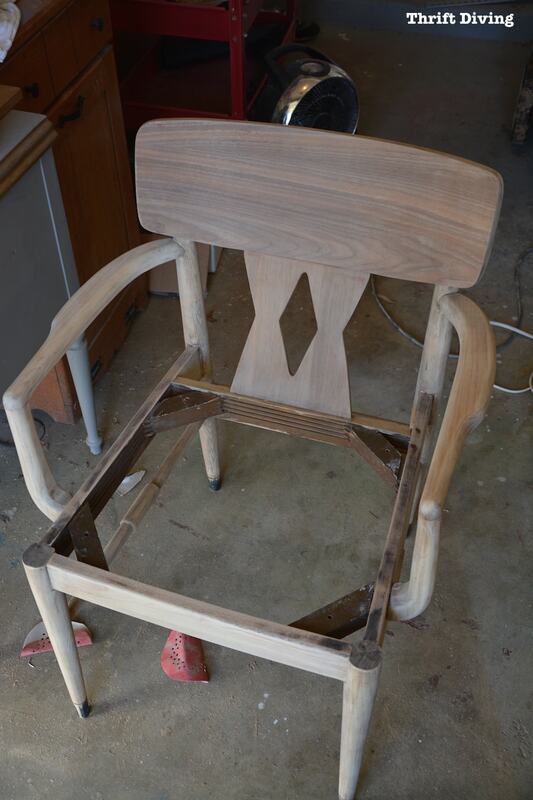 But let me tell you….Stripping a chair is HARD, yo! Especially when you have all those round surfaces and you have to figure out how to get a FLAT sander around a CURVY leg. And crappy sanding jobs lead to crappy finishes. That’s exactly what happened with this chair! 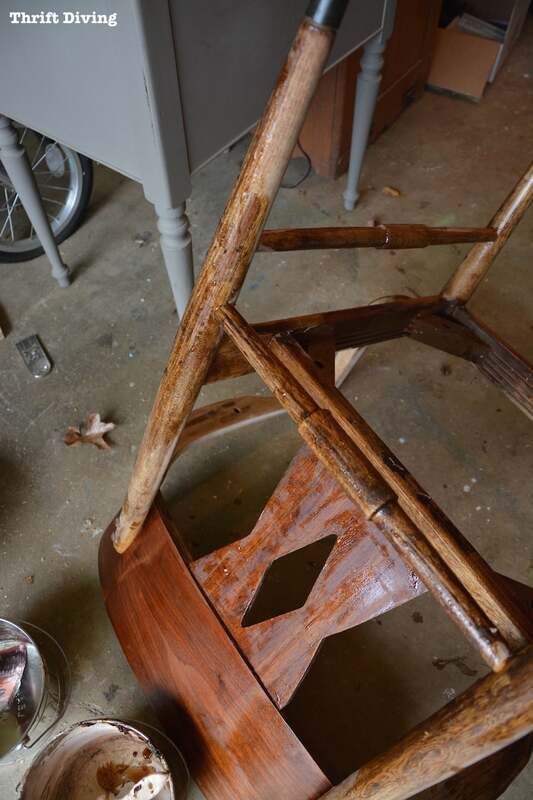 I had such high hopes for a restoration of this chair, but it was just not the right project to try stripping! 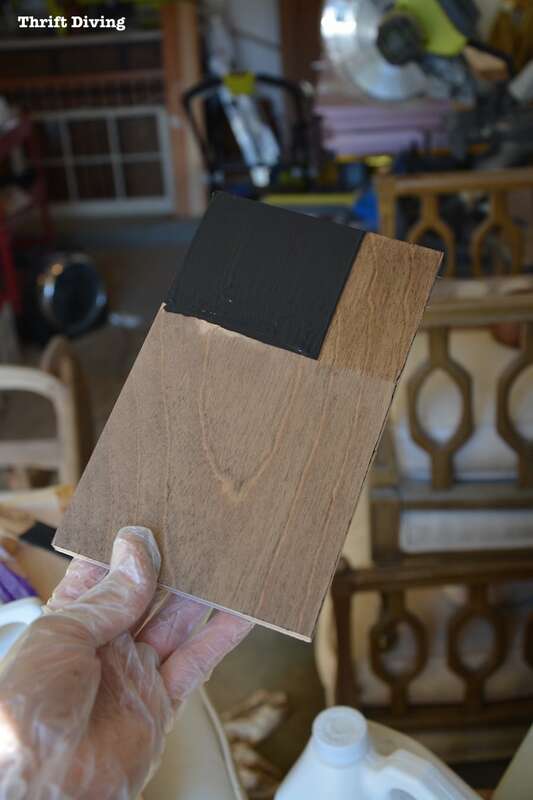 Stick to flat surfaces where you can easily apply stripper and can run sanders over said flat surfaces, like table tops, dresser tops–any flat surfaces. Curves?? Don’t do it to yourself. Trust me! I thought I had removed as much of the previous stain as possible. 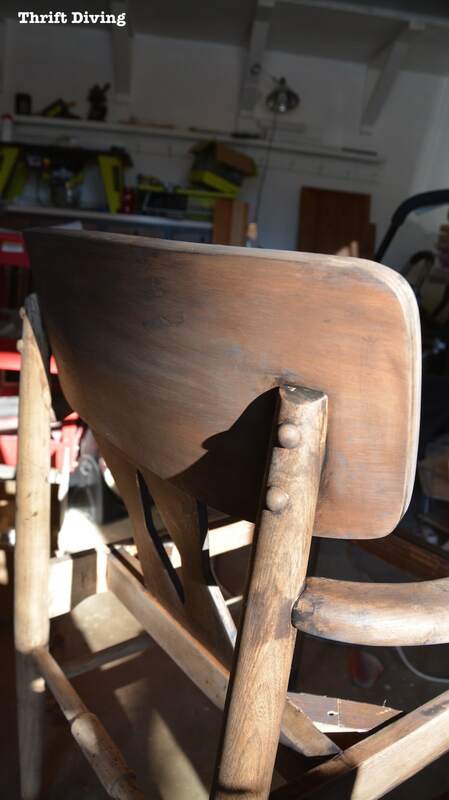 One thing I had noticed is that the wood on the back of the chair was different than the wood on the arms and side. The arms and sides looked like oak, yet the back was a composite of something else….. Regardless, it was pretty grain, and I was going to attempt to keep it! 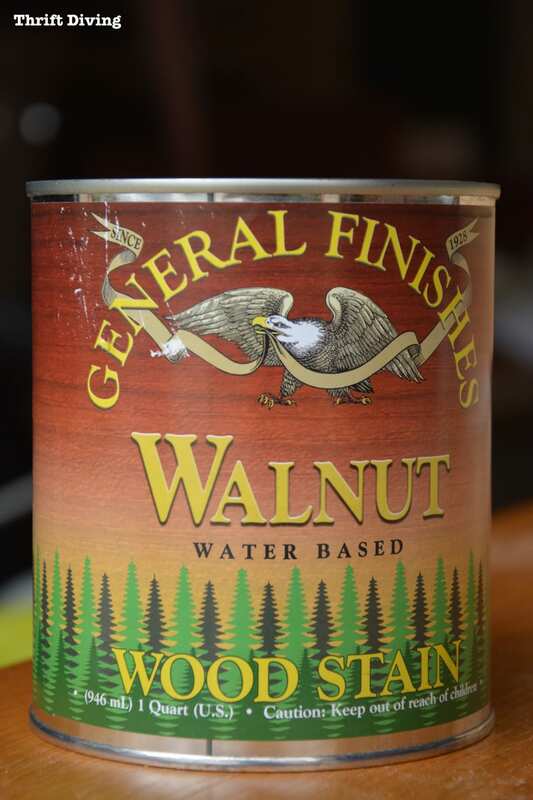 I’ve been thinking a lot lately about the safety of DIY products we use, so along with the gentle stripper, I wanted to try the General Finishes Walnut stain which is water-based and earth-friendly (and even safe for kids toys!). 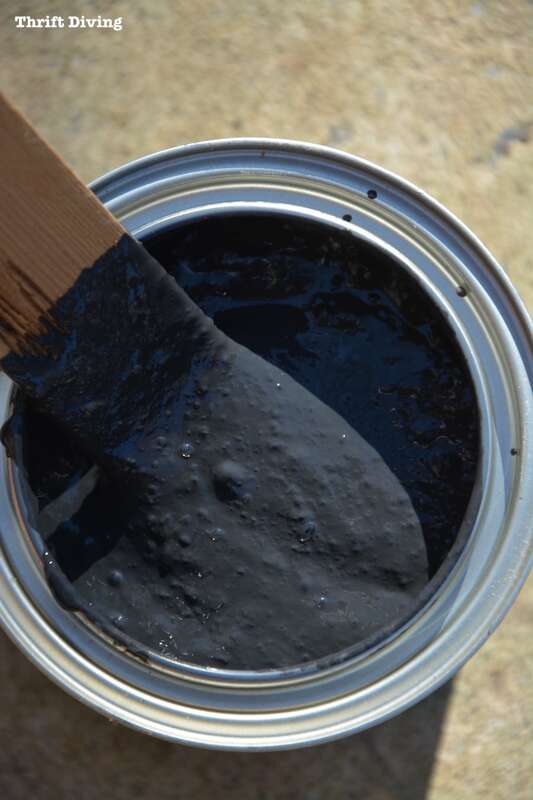 This one, however, looked like a grainy-looking paint. But the one thing I noticed–OMG!–it didn’t smell! 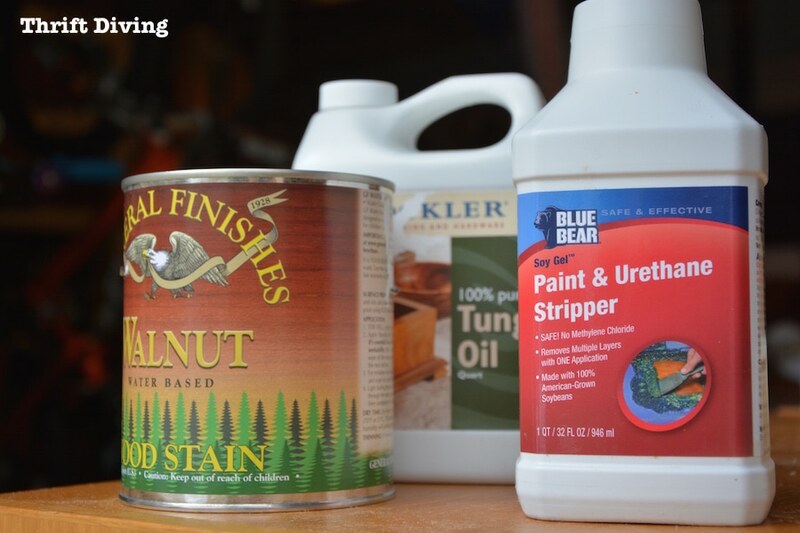 You know how nasty oil-based stains are?? I definitely wanted to do a test first. I had hoped the color would be darker, so I left it on for various amounts of time to see what I’d get. I left it on for about 4-5 minutes. Not sure if that is “allowable” but it seemed to be the only way to get the rich color I wanted. Yep, about 4 minutes was the look I was going for! The instructions say to only work in sections at a time, so I did. I started with the back, using a brush to wipe on a bunch, then giving it a few minutes to darken, and then wiped it off with a towel, going in smooth directions with the grain. First, my camera battery died, unbeknownst to me, so what I thought was recording me wiping on and wiping off, didn’t capture everything. So unfortunately, I don’t have an “after” picture to show you what the first coat looked like! Crap! The other thing that was going wrong was that every time I would move to a new section, the towel would graze up against the finished parts, and I would be left with little blotches on the freshly stained sides! Totally my fault since I should have had a bigger supply of clean towels! Plus, smaller towels are a great idea so there’s less chance of a big towel flinging stain to other finished parts. 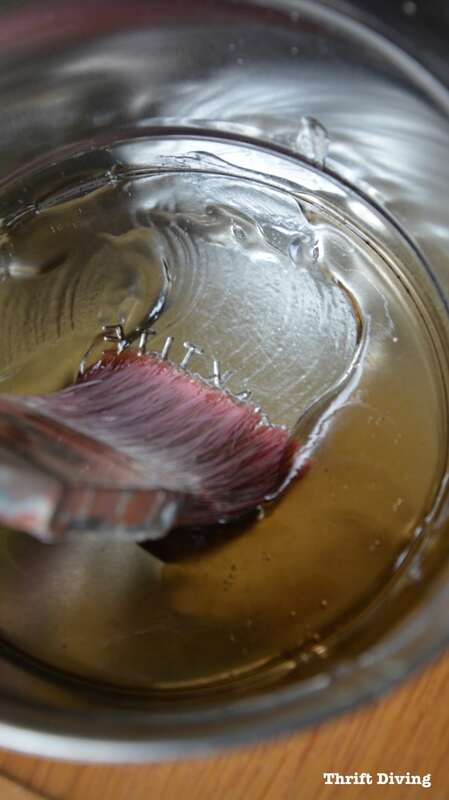 Trying to wipe up those blotches creates a muddled mess. UGH! Whatever crappy sanding job I had done was pretty clear now! I wasn’t even able to make it to the fabric store for new fabric for the seat (I’ll tell you about that in the comments section….). 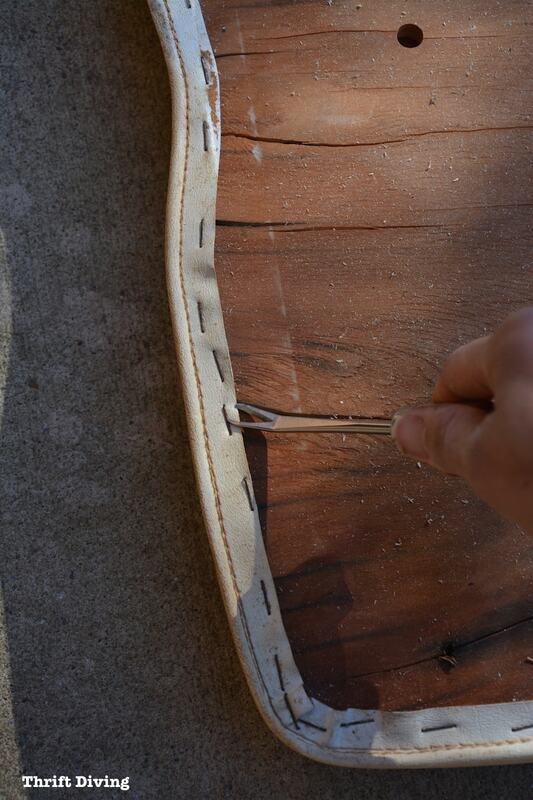 All I could do that day was start to remove the staples of the old fabric. Sometimes I love to find myself in this predicament. You know, failed project = creative genius. I’m going to turn this project around this week one way or another! Most likely I’ll have to re-sand and attempt to re-stain the back of the chair (since I love that wood and would never want that painted). But I’m going to have to paint the body of the chair. There’s too much variation in color. 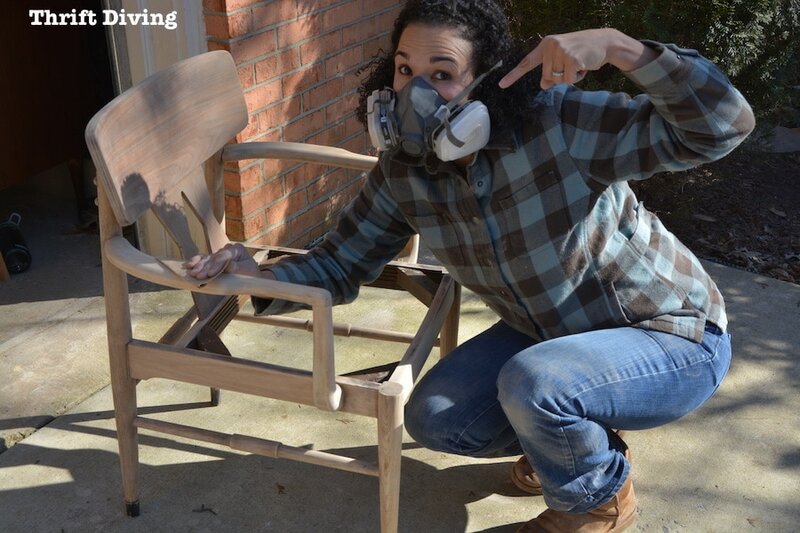 UPDATE: Click here to see how the chair turned out in Part 2 of this chair makeover! Yes, the chair was disgusting! The WORST design with a fabric skirt that was revolting. All the fabric was a small ORANGE (rust) print like colonial gone amok. Actually, had a nice neighbor not given it to me I’d never have touched the thing. So, the chair was from the 70’s and it had been”chewed up” over time. Since the upholstery was part of the chair the wood on the seat was never meant to be seen – It was rough and nasty to touch. There were springs for the rocking mechanism that were not meant to be seen either. It was made of many different kinds of wood and I never even considered staining it. Now it’s updated for a simpler, cleaner more timeless look and everywhere that fingers can touch it is smooth as silk. So I sanded and sanded and then I painted it. It is comfortable and can fit in with many styles of furniture. Considering what this thing began life as – this was a very classy upgrade. As for learning from my cushion fabric cutting mistake – I learned NEVER to ATTEMPT serious Upholstery again. I need to stick with my strengths or I’ll overdose on doughnuts and blow up like a balloon! Try turquoise lacquer with a white background fabric seat, I’d love to see that; your chair wants to be fun and not serious anymore. Chairs are really tough to do. I’ve done a few over the years and they always cause me extra work and lots of trouble. Electric sanders don’t do the job right because of all the rounded parts involved in a chair. Last major chair I did quite frankly was hell on earth! Getting the parts sanded smooth enough to pass my “hand test” was awful. LOTS of hand sanding around all the legs, braces and back. Took me ages to do. I had planned to paint it white and I sprayed it upside down and all around until I really liked the finish. Finally I made the cushions – the originals were flat and awful – so I traced them and cut them out of really thick foam. Used a backing, covered with muslin and finished with some fabric I’ve had for years, just waiting for the perfect project. Everything looked great – I was so happy. At the last minute one wrong snip with my scissor turned a perfect seam into a mess! (no extra fabric left) I felt like all my work was wasted and I hated the way it looked. I controlled my frustration and did not kick it to the curb! I stuck it in to my office and I’ve gradually learned a lot from it: never cut any fabric and sew it to upholster anything ever again! Honestly though I used a difficult to match pattern and it all lines up perfectly which makes me very happy and proud of myself – I’m not a sewing person and the cushion is not straight lines- it is curvy – all in all -I was way over my head and it is an acceptable job just not for the living room!. 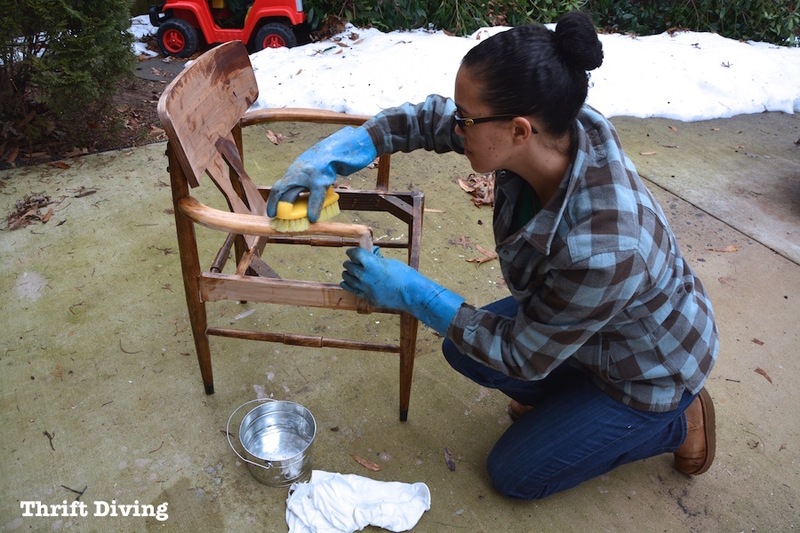 You will manage to make that chair sparkle because you always do! 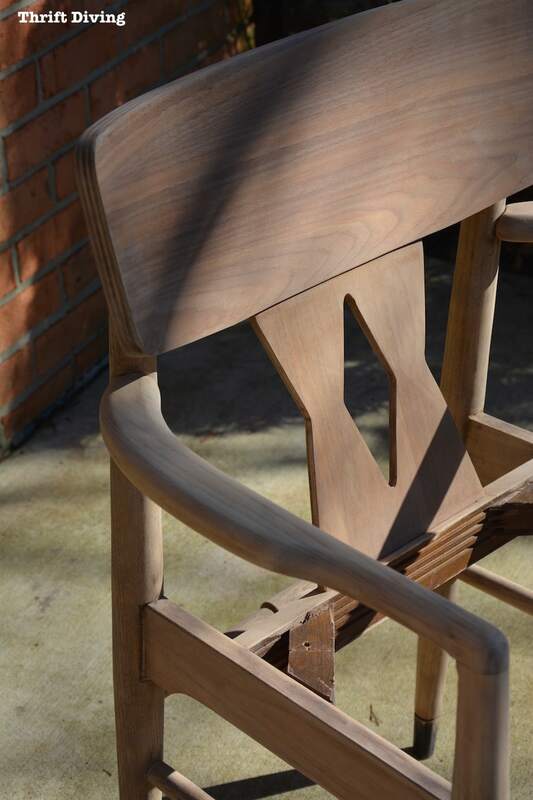 You’ve hit the problem with chairs right on; different parts of a chair are always made with different wood. Often saving money for the manufacturer is the reason but sometimes the actual strength of the individual wood pieces plays a big part too. That chair might look great in a bright Lacquer finish like aqua (I think a favorite of yours?) or red. Wow, that chair sounds difficult! Are you saying that you sanded it down and THEN painted it? Or were you trying to stain it? And way to go on the lesson you learned with that pillow! It’s in those moments we learn so much, right?? 🙂 And lacquer sounds GREAT for that chair!! I may just have to do that. I tried black so far and I hate it. BLEH! Oh, yeah, that’s the way to do it… let us read about your ‘failure’ and then you get twenty three different suggestions of how to get er done from all the comments. 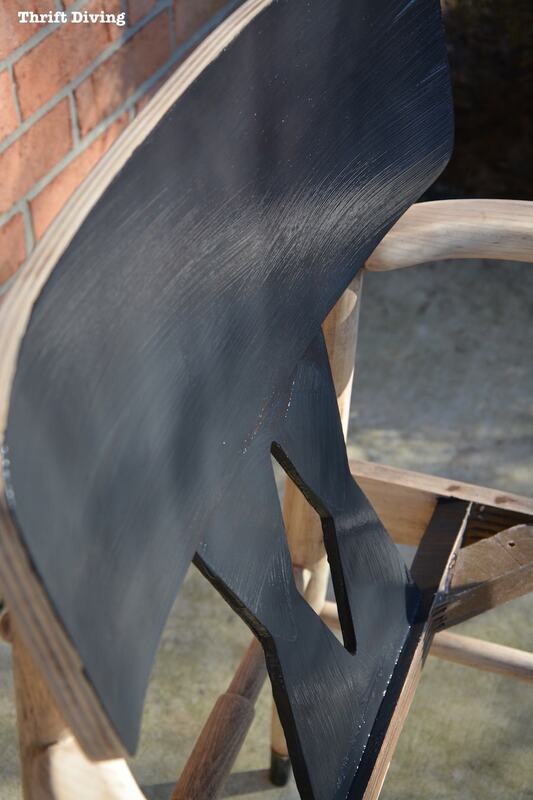 I like the idea of painting the really tricky parts while leaving some of the beauty of the wood on the other – I bet you’ll make a fortune off of the finished chair! I love your honesty! And you really know how to write an engaging story. I can’t wait to hear how it turns out! Grooooaaaannnn. Ugh. You are brave. I’d have pulled out the chalk paint. ..or set the chair near the dumpster for the meth heads to take. I had a similar hair – pulling experience with a wall stencil. There were rears and screams. Haha. I guess we all have to experience that one project. Eager for the next installment. LOL, the meth heads. 🙂 We must really love what we do if we keep going despite set-backs!